Insight allows multiple users to effectively utilise a single Insight project through the use of innovative object ownership and sharing principles. Understanding these principles will make your life easier if you plan on sharing a project. This is particularly important for users who have previously worked with pre-3.0 Insight projects as multi-user projects behave somewhat differently now. It is very important that Insight is installed properly when multiple users are working simultaneously on a single project. If the IT environment is not correct, it may cause data to be corrupted. Please ensure that your IT specialist has read and understood the IT/Data Manager Guide before proceeding. Everything in the project database has an owner. This is not for security; anyone can take ownership of any object. Rather, its primary purpose is organisational. It serves to encourage people to talk to each other, and to prevent people from stepping on each other, by ensuring that only one person can modify something at a time. Taking ownership of an object prevents someone else from modifying it. This means that someone who has in-progress modifications will lose them — taking ownership must therefore be done with caution! If you are unsure whether the owner is modifying something, talk to your teammates! The ownership concept is designed to encourage communication, not substitute for it. Mouse over an item in the product tree in the Control Panel to view the details of the owner and author of the item. Tip: The item which you are the owner is indicated by a small key at the top left corner of the item icon. In the Control Panel, open a product tab. 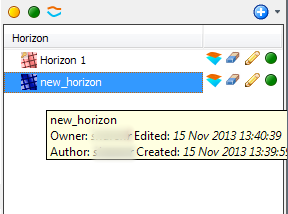 In this example, open the Horizon tab. Select the item(s) which you want to take ownership. Right-click and select Take Ownership. You will also be prompted to take ownership of an item which you do not own if you attempt to edit it. 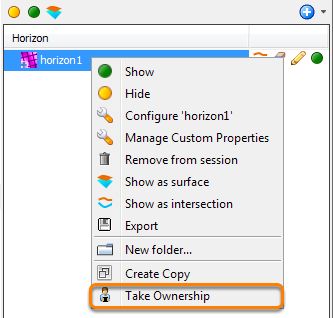 For example, attempting to modify a horizon you do not own will show an Unmodifiable Horizon dialog similar to the above. Click Take Ownership if you are sure that the owner is not currently working on the item. Note: For items in product tabs such as Fault, Well, Probe, Arbline, Polygon and Mute, the pencil icon to enable picking will be disabled if you are not the owner. To take ownership, right-click the item(s) in the Control Panel and click Take Ownership of this (these) item(s). Then you can enable the picking mode. Select the item(s) which you want to relinquish ownership. Right-click and select Relinquish Ownership. 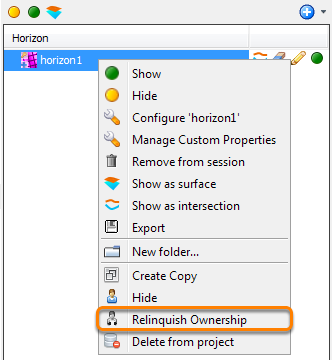 Tip: When you create a new item or import an item for the first time in a session, you cannot relinquish ownership of the item as the context menu option for Relinquish Ownership will be disabled. Save the session and only then can you right-click the item(s) in the Control Panel and select Relinquish Ownership. Almost every Control Panel tab has an Add icon at the top-right to find items already in the project database and add them to your session (see Loading Items in the Project). By default, the search dialog shows you all items owned by everyone, shared or not. To show items that are either owned by you, or are marked as shared, select the Only show shared items check box at the bottom left of the window. This reduces the amount of irrelevant or incomplete work through which you must otherwise sift. To be clear: Flagging an item as "shared" ONLY affects what shows up in the search dialog when the Only show shared items check box is ticked. The shared flag has no other effect. It does NOT prevent someone from viewing an object, nor does it affect what they get when they open a session. When someone opens a session, they get everything in the session, shared or not. However, for the consideration of other users, you should only flag an item as shared if you are happy with other users viewing/modifying the item.